Are you struggling to choose between a tub and a walk-in shower? You are not alone. Homeowners who are remodeling or constructing a new bathroom get stuck on this question a lot. Both styles have their pros and cons. Take some of the guesswork out of the equation and answer these 6 questions. Do You Already Have a Tub? It’s tempting to rip out all tubs and install trendy walk-in showers, but most realtors would advise against this. If you’re going to sell your home, pulling the tubs will isolate expectant couples and families with small children. If there’s a tub in your small guest bathroom, replace it with a shower-only unit to give them more space to change and get ready. 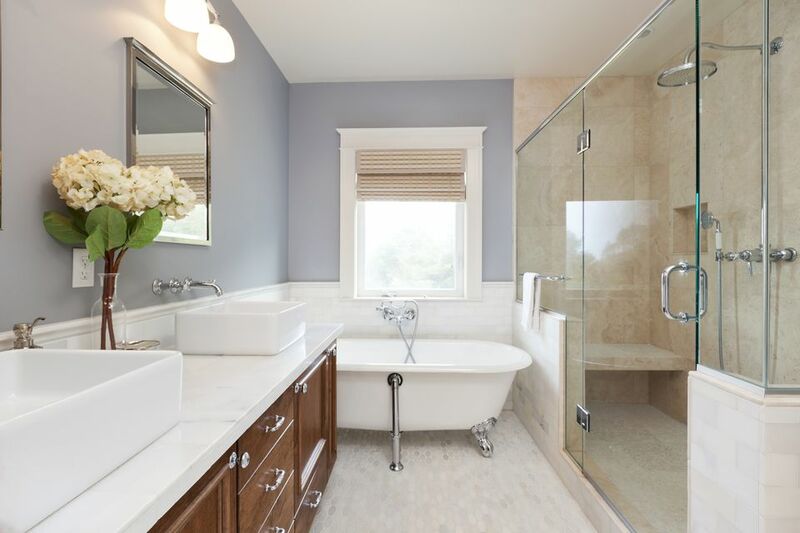 If there’s a tub in your master suite, consider keeping or updating it for resale purposes. If it’s in your forever home, and you never use it, it may be time to replace with a luxury shower or sauna. The average bathroom is 40 square feet and a standard tub is 15 square feet. Bathrooms see a lot of activity, and cramped spaces induce stress. A walk-in shower may be the right choice if you have a small bathroom because they take up an average of 12 square feet of floor space. That extra 7% of open floor can make a surprisingly big difference. Who Is Using This Bathroom? Think of either the people in your household or your potential buyers. Young, busy couples tend to prefer walk-in showers over tubs. The same is true for many elderly and disabled individuals because walk-ins are easy to get into and out of; however, these homeowners tend to prefer a place to sit and railings for safety and ease. Although, it would be difficult for parents of babies and toddlers to manage bath time in a shower. If you are looking to age-in-place, a shower is a good investment. If you are planning to start a family, make sure you have at least one tub. Baths in a master suite are usually only used by adults. If you plan to keep or install a master bathtub, consider deep, stand-alone models. These provide a luxurious option for those who like to soak in comfort. There are models for every aesthetic, easily incorporated into modern, rustic and antique designs. You can even look for varieties with jets or internal heaters that help keep the water warm. Today’s efficient shower heads will save you money on your water bill. The average shower only uses 20 gallons compared to the average bath’s 30. This is a bonus for your wallet and it also makes your property more competitive in the resale market. Energy efficiency is a top priority for today’s homebuyers. According to HomeAdvisor, the average cost to install a tub is $3,000, while it’s an average of $6,000 to build a walk-in shower. Don’t let the price tag of a walk-in deter you. This style is trending in every region and surveys show that 65% of homeowners want showers in their home. In fact, bathroom remodels can increase resale value by 20%. If a walk-in doesn’t fit your budget, a standard shower stall might be the next best thing. They average $3,500 to install. If you’re leaning toward a tub and you have more room in your budget and bathroom, look into whirlpool and air-jet versions. Swapping one tub for another is a relatively simple project, unless your new one is larger or more complex. Replacement should only cost $500 to $1,100. Converting from one style to another, however, is where things get hairy. The cost to convert averages $200 to $5,000. Knowing the costs and benefits of each style can help you make an informed decision. The choice goes beyond your own taste and impacts resale value, energy efficiency and family living. Consider how much space you’re working with, who will use it and how much you want to invest and hopefully the right choice will be clear.